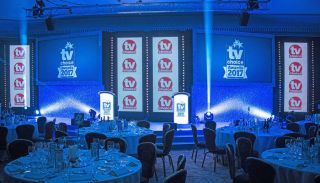 S+H Technical, working for Stoneapple Productions, supplied their 12mm LED surface for 2017 TV Choice Awards in The Ballroom at the Dorchester Hotel, Park Lane in central London. Stoneapple has designed and produced the TV Choice Awards for many years and S+H has been supplying screen for the last three, and before that starcloth and other specials. This year, four columns – two per side - of the S+H’s 12mm LED product flanked a main projection screen positioned upstage centre. The LED columns each measured 7 metres high by 1 metre wide, and in between each of these was a vertical row of blinder lights. The LED columns were used to display a variety of video content produced by Stoneapple for the event, including Awards graphics and aminations, for which they were highly effective. The 12 mm was chosen for its brightness and good resolution, light weight and modular construction, and the panels were supplied in touring frames for speedy installation – for which S+H sent a crew to site to co-ordinate and tech the kit for the get in / out and the show. Pavani Watt and her team at Stoneapple were constantly in touch with S+H to supply a variety of products including LED starcloths and LED floors which are utilised on a variety of projects. “Terry and all at S+H are great people to work and do business with," said Watt. "They have an excellent range of products which are different, interesting and often featuring new technologies. The service is fast and efficient … and always with a smile”.